Our 2017 budget is also an internationally recognized, award-winning budget. 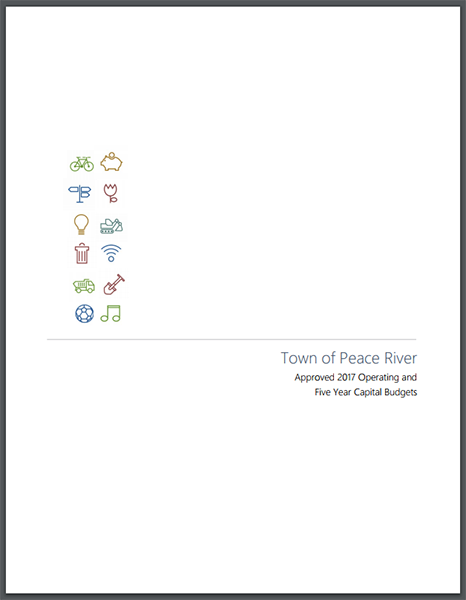 The Government Finance Officers Association (GFOA) has announced that the Town of Peace River, Alberta, has received GFOA’s Distinguished Budget Presentation Award for its budget. When a Distinguished Budget Presentation Award is granted to an entity, a Certificate of Recognition for Budget Presentation is also presented to the individual(s) or department designated as being primarily responsible for having achieved the award. This has been presented to Corporate Services Department. There are over 1,600 participants in the Budget Awards Program. The most recent Budget Award recipients, along with their corresponding budget documents, are posted quarterly on GFOA’s website. Award recipients have pioneered efforts to improve the quality of budgeting and provide an excellent example for other governments throughout North America.